Horizon Zero Dawn makes this a bit different to other similar priced bundles. Just scroll down to the 2 special offers. 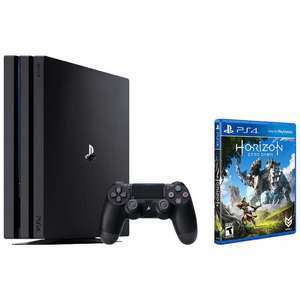 Add the Ps4 Pro you like, then add Horizon and then one Playlink game of your choice. Was u the dude that found the Xbox one s deal at tesco? Yeah, from it's current full RRP of £349.99!. So yeah.... Heat added!, especially in white with Horizon Zero Dawn. Let’s see if anyone can beat the Currys deal.... albeit super unlikely. Very is the better deal at the moment with £50 cashback. Bang on mate. Saturday morning is gonna see discounts I reckon. I'm aiming for 270 for 2 top titles and an old one, plus a Now TV pass. You'd be nuts if you're in the market for a new console, and are concerned about saving money to buy one at this price and not wait another week or two to see how prices pan out. If you're not so concerned about saving pennies, some people aren't, so fair enough - this could be the deal for you, but if you are, and you can wait, why not? Boxing day at the latest will give us a truer picture on pricing. Yeah, from it's current full RRP of £349.99!.So yeah.... Heat added!, …Yeah, from it's current full RRP of £349.99!.So yeah.... Heat added!, especially in white with Horizon Zero Dawn. These 299 deals are popping up all the time now. 349 is the old price. 299 is the new normal, and Sony / the retailers know that is pretty much overpriced for the market. Bang on mate. Saturday morning is gonna see discounts I reckon. I'm …Bang on mate. Saturday morning is gonna see discounts I reckon. I'm aiming for 270 for 2 top titles and an old one, plus a Now TV pass. You'd be nuts if you're in the market for a new console, and are concerned about saving money to buy one at this price and not wait another week or two to see how prices pan out. If you're not so concerned about saving pennies, some people aren't, so fair enough - this could be the deal for you, but if you are, and you can wait, why not? Boxing day at the latest will give us a truer picture on pricing. I do agree with you mate but potential buyers should also be aware that stock will certainly be limited so it could end up like the LG OLED/ PSVR situations where there were great deals but hardly any stock. I myself have bought one and will simple return it if a better deal (with stock) appears in the next week. My prediction for next week is PS4 Pro 1TB black with Fifa 18/COD, GT, tier 3 game for £279. I think retailers are aware that COD/FIFA are the most correlated so they're just as likely to shift both GT and COD if you didn't have COD in the bundle (as people will buy the COD separately) if that makes sense. Best of luck with your hunt! I do agree with you mate but potential buyers should also be aware that …I do agree with you mate but potential buyers should also be aware that stock will certainly be limited so it could end up like the LG OLED/ PSVR situations where there were great deals but hardly any stock. I myself have bought one and will simple return it if a better deal (with stock) appears in the next week. My prediction for next week is PS4 Pro 1TB black with Fifa 18/COD, GT, tier 3 game for £279. I think retailers are aware that COD/FIFA are the most correlated so they're just as likely to shift both GT and COD if you didn't have COD in the bundle (as people will buy the COD separately) if that makes sense. Best of luck with your hunt! That makes sense, most definitely. Good tactics there, have to agree with that. Nice one! £299.99 with a game will be the new RRP price for the Playstation Pro. It's a move designed to further cement the console as the best selling console over the XboxX which costs a full £150 more. The normal Ps4 will eventually be phased out with the Pro replacing it, especially so when the PS5 comes out 2019. £299.99 with a game will be the new RRP price for the Playstation Pro. …£299.99 with a game will be the new RRP price for the Playstation Pro. It's a move designed to further cement the console as the best selling console over the XboxX which costs a full £150 more.The normal Ps4 will eventually be phased out with the Pro replacing it, especially so when the PS5 comes out 2019. Tell us more about this PS5 launch. If the Frozen Wilds is "dlc", can't people download it? Interested in getting one but still think it is way too overpriced. It's a 5 year old console, should have a RRP of £100 (£150 for pro) now as it's inevitable something new will be here soon. These bundles should be £250 max. Interested in getting one but still think it is way too overpriced. It's …Interested in getting one but still think it is way too overpriced. It's a 5 year old console, should have a RRP of £100 (£150 for pro) now as it's inevitable something new will be here soon. I think they are referencing that this is still a PS4, it isn't that much more powerful. Consoles segment is terrible now, was getting worse for a while. Subscriptions / lock-ins, dlc (MANY variations, many of which are a ripoff) now incremental console upgrades so they can pass even more of the cost of locking down the security on these systems.